The 11th Annual University of Pittsburgh Chancellor's Weekend itinerary included a visit to WISER on Friday, September 19th. 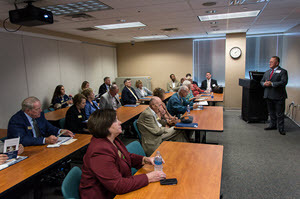 As the new Chancellor, Patrick Gallagher toured WISER for the first time along with invited alumni and guests from various distinguished backgrounds to see the latest advancements in educational programming. WISER's director, Dr. Paul Phrampus, gave an introductory presentation describing WISER's evolving role in the University and health system. Following the presentation, the Chancellor and his guests were treated to a hands-on tour of WISER's facilities led by Dr. Phrampus and Associate Director, Dr. John O'Donnell. 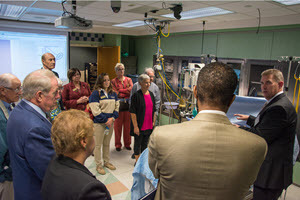 The tour allowed the guests to experience what a typical student or practicing professional goes through on a daily basis as well as observe several active courses included the Emergency Medicine Cases and the Central Venous Cannulation Training courses. 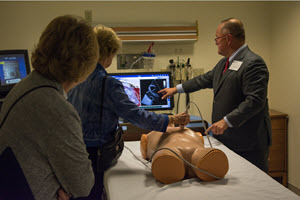 Finally, the Chancellor and his guests learned how to perform echocardiography procedures using the latest technology in ultrasound simulation. WISER would like to extend a warm welcome to Chancellor Gallagher and wish him the best as chancellor of the university! Hail to Pitt!